From the top menu, go to Manage > Locations. Specify a Location Name. Optionally, specify a custom display name if you want to display a different name to clients on your booking module and landing page. For example, you might want to name your location Store #8329 internally, but have it be displayed to clients as New York. Optionally, you can specify a Description, Address, and Contact Info as well. Click on the Settings tab. Set the location's time zone if it differs from the time zone set for your account. Choose the Location Type: Fixed or Mobile. Associate the location with at least 1 Staff/Calendar. 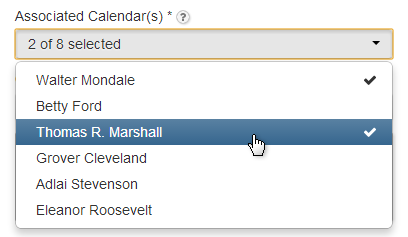 Select the Associated Calendar(s) dropdown button. Selecting Staff/Calendar name(s) places a check mark next the selection(s). Select multiple names to associate more than one Staff/Calendar. Set the Visibility Options for the location.